Posted 4/27/2018 5:28pm by David Paulk. It was so great to see so many of you last week at the first market of the season! It will be another lovely spring day at tomorrow's market and we have plenty of very fresh, organic veggies just for you! Photos below. 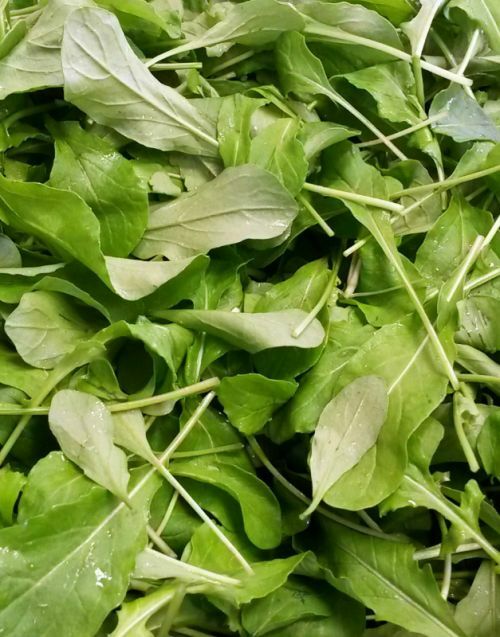 - Arugula: We have plenty of baby, spring arugula with a mild kick. 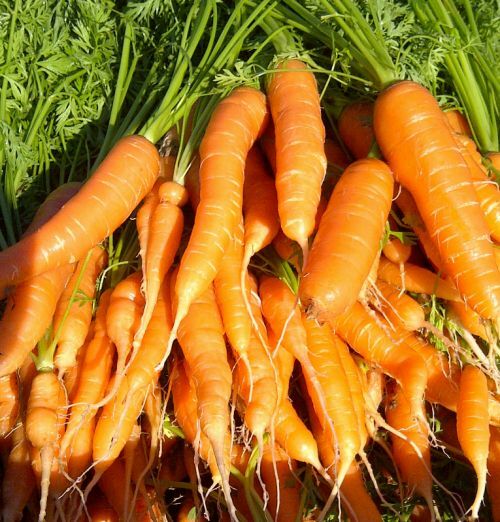 - Carrots: Fresh, aromatic and crisp carrots. Wonderful roasted, steamed, or sauteed with a little butter. Wonderful juiced! Adds a natural sweet flavor and essential nutrients. - Rainbow Chard: Beautiful, glossy leaves and colorful stems. They have just as many nutrients as kale, and you can eat the sweet, crunchy stems when sauteed! Try sauteed with golden raisins (or chopped sweet onion) and lightly toasted pine nuts. - Curly Kale: This is the kale you are most familiar with that you can use in soups or simply sauteed. Also very easy to use in a kale salad. Just remove stems, cut/tear into bite size pieces, massage with a little olive oil, and then add your favorite dressing. It's that simple. - Lacinato Kale: Also known as "Dino" or "Tuscan" kale. Very tasty alternative to the traditional curly kale. It makes great kale chips and salads. 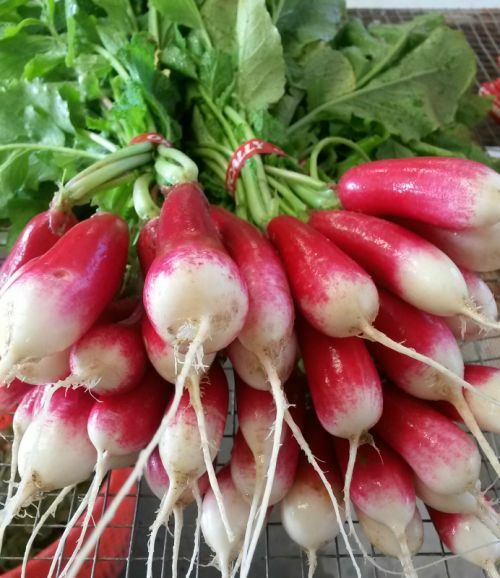 - Radishes, Pink & French Breakfast: Beautiful, crisp and tasty! Of course great on a salad, but try eating them with a little salt and butter, as they do in France, Germany and Eastern European as an appetizer. It may sound unusual, but the flavors really compliment each other. - Salad Mix: Convenient, delicious and ready to eat salad. Perfect blend of red and green butter heads and oakleafs. - Scallions: Mild green onions, perfect raw in salads or sprinkled on top of your stir fry, but don't cook too much. These are young, green, and delicate; add them towards the end of cooking your dish. - Sweet Potatoes, Covington & Murasaki: We have your favorite orange and purple (Japanese Murasaki) sweet potatoes. So, easy to bake whole or slice and roast as sweet potato fries. Just slice 1/4 inch thick, toss with a little olive oil, roast in oven at 350 degrees for 15 mins, flip the slices and roast for about 5 mins more, sprinkle course salt (and pepper, if you like). That's it! You have a guilt-free, sweet and so good for you side dish for dinner/lunch or serve with eggs at breakfast! - Hakurei Turnips: White, sweet and crunchy Japanese variety of turnips. Wonderful raw in salads or simply sauteed or steamed, along with, of course, the tasty turnip greens. We take cash, credit, debit and SNAP cards. So, we hope to see you, your friends and family members on Saturday (BAE parking lot, 9am - 1pm). We've missed you and hope that you are all doing well. Posted 4/27/2018 5:16pm by David Paulk. Posted 4/20/2018 6:26pm by David Paulk. It will be a lovely cool spring morning for our first market back. We have a ton of veggies and can't wait to share them with you! We're really looking forward to seeing you all and can't wait to catch up! - Leeks: Fresh, uniquely-flavored leeks. Key ingredient in fish or potato soups. 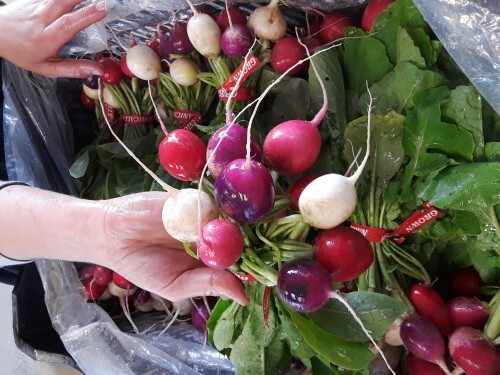 - Radishes, Red & French Breakfast: Beautiful, crisp and tasty! Of course great on a salad, but try eating them with a little salt and butter, as they do in France, Germany and Eastern European as an appetizer. It may sound unusual, but the flavors really compliment each other. - Spinach: Freshly harvested, tasty spinach that is ready to eat raw, steamed, sauteed, or juiced. Tomorrow's spinach will have some larger leaves and is great for cooking or juicing, but certainly can be eaten raw, if chopped or torn into smaller bite sizes as you would do head lettuce. - Sweet Potatoes: We have your favorite orange and purple (Japanese Murasaki) sweet potatoes. So, easy to bake whole or slice and roast as sweet potato fries. Posted 4/16/2018 8:04am by David Paulk. The 2018 California ("BAE") Farmers Market officially OPENS this Saturday, 21 April (9 am - 1 pm)!!! We will have plenty of cool season vegetables to welcome you back to fresh, organic, local eating. As always, we accept cash, credit, debit and SNAP cards. So, we hope to see you, your friends and family members at the Saturday California Farmers Market this year! We've missed you and can't wait to see you and catch up. We hope that you are all doing very well. Need Housing for New Farm Employee! Posted 3/14/2018 10:02pm by David Paulk. We are hoping you may be able to help us out. We have a new employee, an aspiring farmer, who is moving here from Annapolis and needs housing starting 1 April. She is interested in an apartment, in-law suite, finished basement or room that is no more than 30 minutes from our farm in Leonardtown. Her preference is to live alone, but is open to one or more female roommates. If you have any leads, please contact Kelly Ostergren at (410) 897-2240 or ostergkl@gmail.com. It's almost time for the start of the California Farmers Market season (21 April - 17 November 2018)! We're busy getting ready for market! As you know, it's been a pretty chilly and gray winter, but we are on track to have lots of greens, including salad mix, spinach, kale, chard, leeks, carrots, sweet potatoes, oats, flour and more. We'll be emailing you in April with more details; meantime you can follow us on Facebook. We look forward to seeing you again soon and appreciate your support of our farm and employees. Posted 12/22/2017 11:25am by David Paulk. Tomorrow (23 Dec., 10 am - 1 pm), we will be having an ON FARM MARKET at 23217 Bayside Rd., Leonardtown. The market will be in our barn, so no worries about the weather. What a great way to share with your family and friends delicious, fresh, organic and locally-sourced veggies for your holiday table. Swampfox Farm (our friends from California Farmers' Market) will, unfortunately, not be be able to make tomorrow due to limited inventory. However, we will have plenty of fresh veggies for your holiday table. Please go to our Web site for simple, tasty recipes for all of our produce: www.sassafrascreekfarm.com/recipe. Posted 12/16/2017 9:48am by David Paulk. We'll be having one last farmer's market ON OUR FARM, in Leonardtown, on Saturday, 23 Dec.; 10 am - 1 pm so that you can enjoy our fresh, organic vegetables for your holiday meals. Swampfox Farm will be there too! See details below. Swampfox Farm (our friends from California Farmers' Market) will also be on our farm selling their delicious pork, poultry and duck eggs (https://www.facebook.com/swampfoxfarmLLC/)! What a great way to share with your family and friends delicious, fresh, locally-sourced veggies and meat for your holiday table. Please go to our Web site for simple, tasty recipes for all of our produce: www.sassafrascreekfarm.com/recipe. The market will be in our barn, so no worries about the weather. Last BAE Market Tomorrow (18 NOV., 9 AM - 1 PM)!! Posted 11/17/2017 6:07pm by David Paulk. Tomorrow is the last market of this 2017 season AND it is just before Thanksgiving! We have a lot of what you will need for your Thanksgiving dinners! We have frost-kissed and; therefore, sweeter, freshly-harvested Brussels Sprouts, Carrots, Kale, Arugula, Chard, Red Beets and much, much more. Please see the complete list below. It has been such a great season! We are happy to say that we have met many new customers this season who have discovered our market and stand. We are also so grateful to all of our wonderful, loyal customers who have been buying our vegetables over the years. We have grown to know you and your families. We will miss seeing you all each week. Thank you so much!! You can continue to follow our farm happenings over the winter at our Web site (sassafrascreekfarm.com), facebook page, and at Instagram. You can continue to find our produce at the The Good Earth Natural Foods Store in Leonardtown, at Chesapeake's County in St. Leonard, and MOM's Organic Market in Waldorf until market starts again at the end of April. Please see below for all that we'll have at market tomorrow. - Arugula: We have that spicy green you crave for your Thanksgiving salads! - Beets: Just-harvested Red beets. Great either boiled or roasted, like a potato. Wonderful on a bed of arugula with goat cheese and walnuts. 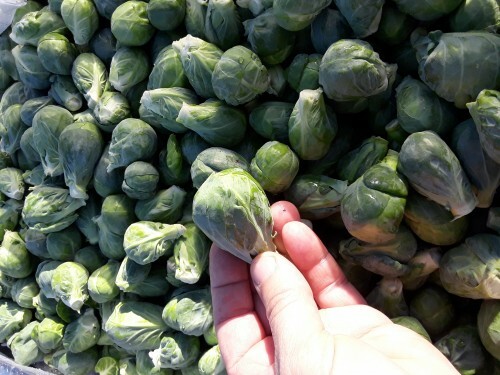 - Brussels Sprouts: We have a lot of super tasty, just-harvested today brussels sprouts! Try sauteed in a little olive oil until a little browned and caramelized. Toss in a little garlic at the end or drizzle with a little balsamic vinegar once off heat. Heavenly dish for your Thanksgiving table! - Cabbage: Smallish cabbages that are so great fresh and are slightly sweet! Wonderful simply sauteed, in soups, use for cabbage rolls...and so on. Much tastier than what you get in the store. Also, try your hand at making homemade sauerkraut! It's really easy, tasty and good for you! Just ask Jen. - Carrots: We have plenty of freshly harvested, sweet bunches of carrots for your Thanksgiving dinner! - Celery: Farm fresh celery is such a treat compared to store-bought. It is so much sweeter and aromatic. It will make a difference in your stuffing, roasts, and soups. We have lots of celery for you at this market! - Rainbow Chard: Beautiful, colorful tasty green. Great side dish for Thanksgiving! Simply sautee some sweet onions in olive oil and then toss in chopped up chard, stems and all! Add golden raisins while cooking for a wonderful contrast with the chard. - All Purpose & Whole Wheat Flour: Yes, we grew wheat on our farm and have milled it into flour! That's 2-lb bags of certified organic whole wheat and All Purpose flour! Think about making all of your holiday cookies, cakes, and pancakes (yum!) with FRESH flour! - Garlic: Last of the season price ($1 ea., if you buy more than one). - Jerusalem Artichokes: a.k.a., sunchokes; look like knobby potatoes, but taste like artichokes. Really good, peeled, sliced/diced, lightly tossed with olive oil, roasted in the oven at 350 degrees until fork tender, and sprinkled with sea salt...like artichoky potatoes. They get a little brown and crispy...yum! 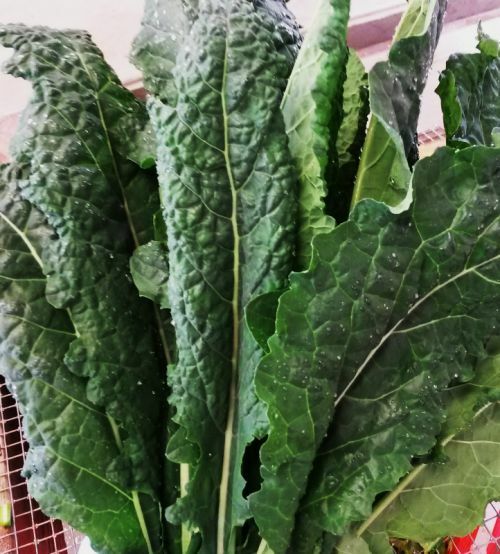 - Kale, Curly & Lacinato: Great sauteed, braised, in soups, as chips or in smoothies. Lacinato Kale is also known as "Dino" or "Tuscan" Kale. We have a lot! - Romaine Lettuce: Freshly-harvested, crisp romaine (limited quantity). - Rolled Oats (Oatmeal): We have 1.8-lb bags of rolled oats (oatmeal), from oats grown on our farm. They have a wonderful nutty, naturally slightly sweet flavor and are certified organic, like all of our produce! Cook them as you would Quaker oatmeal. 2:1 ratio of water to oats; cook time ~15 mins or until desired consistency. We will be bringing a lot for you to stock up for the winter. Think about those oatmeal cookies and apple crisps you'll want to make. Also makes a great gift for the holidays...locally-grown oatmeal! - Green Peppers: These are tasty, savory peppers that are wonderful in any vegetable dish! - Potatoes, Red and Blue: Four varieties of tasty Irish potatoes. The blue potatoes are blue inside and out, full of anti-oxidants, and great for making crispy fries or roasting. German Butterballs are a creamy yellow/white and great for boiling, roasting or making mashed potatoes. And we have our delicious Mountain Rose (red) potatoes, which are absolutely delicious and very versatile. - Radishes: slightly spicy and crisp. Great in dips or plain with a little salt. - Salad Mix: Yes, we have lots of fresh, tasty and ready to eat salad mix! - Sweet Potatoes, Beauregard, Covington & Murasaki: Ye ask and ye shall receive your favorite sweet potatoes! Traditional orange and Japanese purple (outside purple/inside white). - Tomatoes, Red Slicers: Yes, we still have tasty red slicing tomatoes! Last of the season, from our high tunnels. - Fresh Turmeric: The queen of natural anti-inflammatory foods is here! Bright orange and tasty grated into salads or added to vegetable dishes. Key ingredient in curries. Add to smoothies for an anti-inflammatory bonus. See ginger/turmeric smoothie recipe on our web site. You can freeze it! So stock up for the winter! - Hakurei (Japanese) Turnips: Particularly tasty raw. They're sweet and crisp! Great in salads or use as chips with dip, simply sautee or great roasted with a chicken, beef, potatoes and onions! Posted 11/10/2017 3:53pm by David Paulk. Yes!...we WILL be there tomorrow, despite the cold. It will be a beautiful, sunny, very crisp fall day and we are dressing for it. By the way, the cold snap just makes all these cool season veggies taste better, because they concentrate sugars in them to protect against freezing (like anti-freeze). This makes everything a little bit sweeter. So bundle up yourself, your family and friends and come on down to the Saturday Farmers Market! Tomorrow, 11 Nov, is the 2nd to last market in 2017. The last market is Saturday, 18 Nov (Saturday before Thanksgiving). - Broccolini: It is similar to broccoli but with smaller florets and longer, thin stalks. It is a natural hybrid of broccoli and an Asian vegetable, which means it has a milder broccoli flavor, is tender and cooks quickly. See recipes on our Web site. 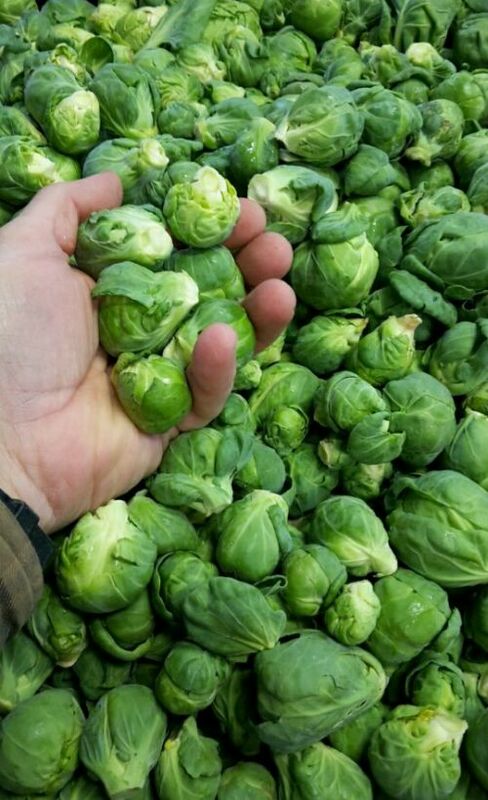 - Brussels Sprouts: Super tasty, fresh brussels sprouts. Try sauteed in a little olive oil until a little browned and caramelized. Toss in a little garlic at the end or drizzle with a little balsamic vinegar once off heat. 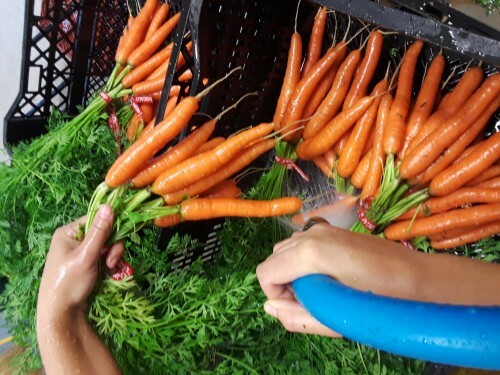 - Carrots: We have freshly harvested, sweet bunches of carrots! - Celery: Farm fresh celery is such a treat compared to store-bought. It is so much sweeter and aromatic. It will make a difference in your stuffing, roasts, and soups. - All Purpose & Whole Wheat Flour: Yes, we grew wheat on our farm and have milled it into flour! That's 2-lb bags of certified organic whole wheat and All Purpose flour! Ask about Semolina Flour...we have a couple bags. - Garlic: Only 1 more market after this one. Stock up today. End of season price ($1 ea., if you buy more than one). - Fresh Ginger (limited quantity): what you've all been asking for is finally here! Freshly harvested ginger has no tough skin and doesn't need to be peeled before grating. Naturally sweet and aromatic. Simply grate and add to any vegetable dish, soup, tea or cookies. Recipes at www.sassafrascreekfarm.com/recipes. - Kale, Curly & Lacinato: Great sauteed, braised, in soups, as chips or in smoothies. Lacinato Kale is also known as "Dino" or "Tuscan" Kale. - Romaine Lettuce: Plenty of freshly harvested, crisp romaine. - Rolled Oats (Oatmeal): We have 1.8-lb bags of rolled oats (oatmeal), from oats grown on our farm. They have a wonderful nutty, naturally slightly sweet flavor and are certified organic, like all of our produce! Cook them as you would Quaker oatmeal. 2:1 ratio of water to oats; cook time ~15 mins or until desired consistency. - Sweet Orange Peppers: Oranos peppers are bright orange, shiny and sweet. So, good raw or grilled! They freeze really well! Freeze whole and enjoy sauteed in the middle of winter. - Salad Mix: Yes, we have ready to eat, tasty salad mix! - Tomatoes, Red Slicers: We have traditional, very tasty red hybrid slicing tomatoes. - Fresh Turmeric: The queen of natural anti-inflammatory foods is here! Bright orange and tasty grated into salads or added to vegetable dishes. Key ingredient in curries. Add to smoothies for an anti-inflammatory bonus. See ginger/turmeric smoothie recipe on our web site. - Hakurei (Japanese) Turnips: Particularly tasty raw. They're sweet and crisp! Great in salads or use as chips with dip. Or saute with our without the greens (turnip greens, remember?!). Great also roasted with potatoes and onions with a roast chicken or beef! Posted 11/3/2017 5:47pm by David Paulk. It will be a slightly cloudy, cool day tomorrow (no rain until after market). We have a bounty of fall vegetables, including...wait for it........brussels sprouts! Great weather for wearing your favorite fall sweater and bringing your family and friends to the farmer's market to buy your fresh, organic veggies, and pick up baked goods, meat and your favorite libation for the week! In case you didn't know our market sells local wines, whiskey and now hard cider. We hope to see you there! - Brussels Sprouts (New! ): Super tasty, fresh brussels sprouts. Try sauteed in a little olive oil until a little browned and caramelized. Toss in a little garlic at the end or drizzle with a little balsamic vinegar once off heat. - Arugula: We've got that spicy green you crave! Great mixed with other greens as a bed to grilled salmon or beets and goat cheese. Yum! - Beets: Just harvested Red beets. Great either boiled or roasted, like a potato. Wonderful on a bed of arugula with goat cheese and walnuts. - Rainbow Chard: We have an excellent supply of delicious rainbow chard! Saute like you would kale, with some sweet onion and enjoy! - Fresh Ginger: what you've all been asking for is finally here! 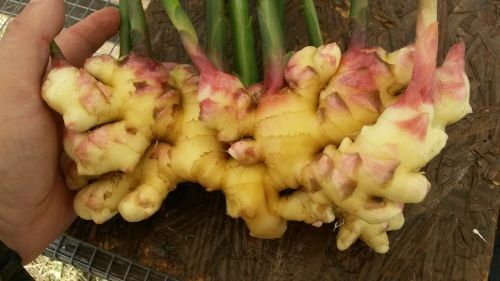 Freshly harvested ginger has no tough skin and doesn't need to be peeled before grating. Naturally sweet and aromatic. Simply grate and add to any vegetable dish, soup, tea or cookies. Recipes at www.sassafrascreekfarm.com/recipes. - Romaine & Bibb Lettuce: Plenty of freshly harvest crisp romaine and a limited number of lovely, sweet bibbs. - Rolled Oats (Oatmeal): We have 1.8-lb bags of rolled oats (oatmeal), from oats grown on our farm. They have a wonderful nutty, naturally slightly sweet flavor and are certified organic, like all of our produce! Cook them as you would Quaker oatmeal. 2:1 ratio of water to oats; cook time 10 -15 mins or until desired consistency. - Radishes, Red and Pink: slightly spicy and crisp. Great in dips or plain with a little salt. - Spinach: Salad-size bagged spinach. Great for eating fresh or cooking. We think you'll like the naturally sweet flavor.